July 2019 marks 50 years since Neil Armstrong took his famous first steps on the surface of the Moon. As people around the world celebrate the anniversary of this great American achievement, they might wonder why there have been no further human missions to the Moon since Apollo 17 in 1972. 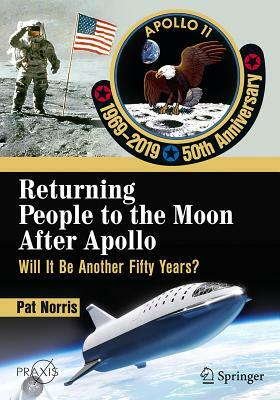 This book assesses the legacy of the Apollo missions based on several decades of space developments since the program's end. The question of why we haven't sent humans back to the Moon is explored through a multidisciplinary lens that weaves together technological and historical perspectives. The nine manned Apollo missions, including the six that landed on the Moon, are described here by an author who has 50 years of experience in the space industry and whose work spanned the Apollo 8-13 missions. The final section of the book provides a comprehensive assessment of today's programs and current plans for sending humans to the Moon. Pat Norris's 50 years of space experience includes the Apollo Moon landings as a NASA contractor and the Hubble Space Telescope as a European Space Agency programme manager. Since 1980, he has worked for CGI, and he is currently a part-time consultant to its Space Business Unit. He was Chairman of the trade association of Britain's space industry, Ukspace, from 1995 to 1997 and Chairman of the Space Group of the Royal Aeronautical Society (RAeS) from 2004 to 2012. He is the author of two books on space surveillance as well as many articles, book chapters and conference presentations on all aspects of space. He is a Fellow of the RAeS and of the Royal Institute of Navigation, as well as a Senior Member of the American Institute of Aeronautics & Astronautics. He was awarded the Apollo Individual Achievement Award in 1969 and the Sir Arthur Clarke Lifetime Achievement Award in 2016.